Spiriteds, we are breaking the rules today. Grain-Free Maple Bacon Coffee Cake is not exactly a traditional coffee cake, but we’re going with it, and the results are delicious. Why isn’t it a traditional coffee cake? Because instead of sprinkling the top with a streusel, we’re topping it with crumbled bacon. I mean, honestly, when in the presence of bacon, who even cares about the rules? This is winning, Spiriteds. It’s how we do baked goods in our house, and it’s a combination of some of my favorite recipes on the blog. Remember when I spent nine months creating Texas-Style Maple Bacon Muffins and said that one try in particular had been delicious but not muffin-ready? You’re tasting that attempt today. 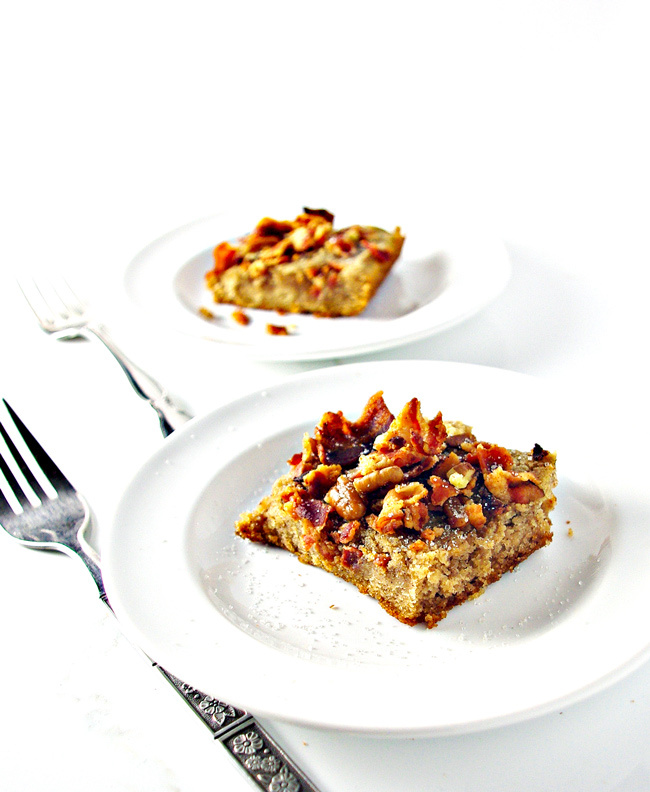 Grain-Free Maple Bacon Coffee Cake is one of the delicious failures from last year. I was also inspired by the spices in Maple Bacon Sweet Potatoes and decided to take the flavor of this recipe up a notch or 40. Finally, last week’s Grain-Free Cinnamon Scones provided inspiration to get the right sweet and savory balance. Of course, a few tablespoons of bacon fat also help with that. Because of the bacon, this recipe takes a little longer to make than others on this blog. To make it easier, I prep the Grain-Free Maple Bacon Coffee Cake batter while the bacon is frying. Once each batch of bacon strips is fried, I set them aside in between layers of paper towels or napkins to soak up the grease. You’ll want crispy, crumbly bacon for this recipe. And if you get a few delicious chewy pieces, what you do with them is up to you. They’ll remain chewy, even after baking, which may be a texture you don’t want in your coffee cake. I typically just stand at the counter and eat those pieces while the rest of the bacon fries. While K-Hubs often accuses me of “eating the profits” (a completely fair accusation, by the way), in this case, sneaking bites is completely acceptable if not completely wise. 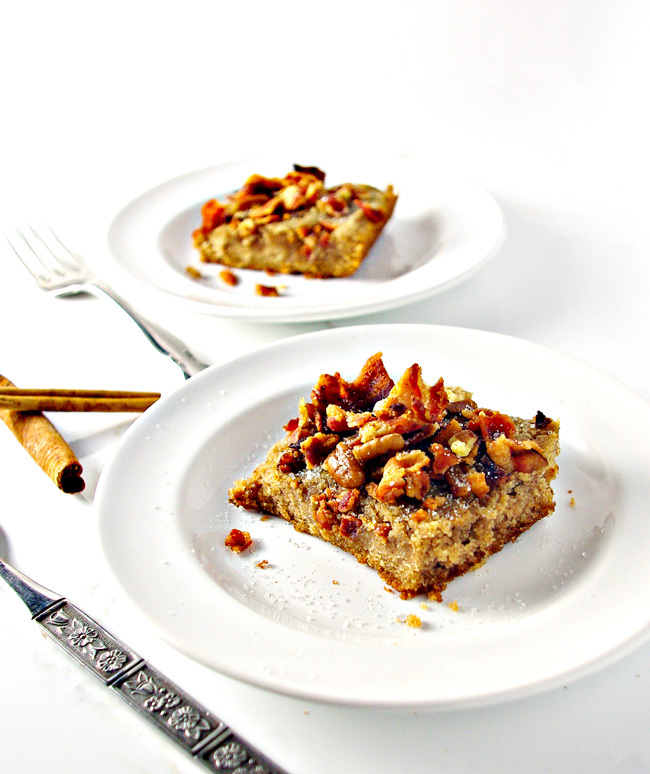 The flavors in Grain-Free Maple Bacon Coffee Cake are holiday-worthy and crowd-pleasing. Four out of four members of our family LOVE this recipe. And who can blame us? Sweet, smoky flavors balance against crispy bacon pieces and maple syrup, cinnamon, allspice, and nutmeg. 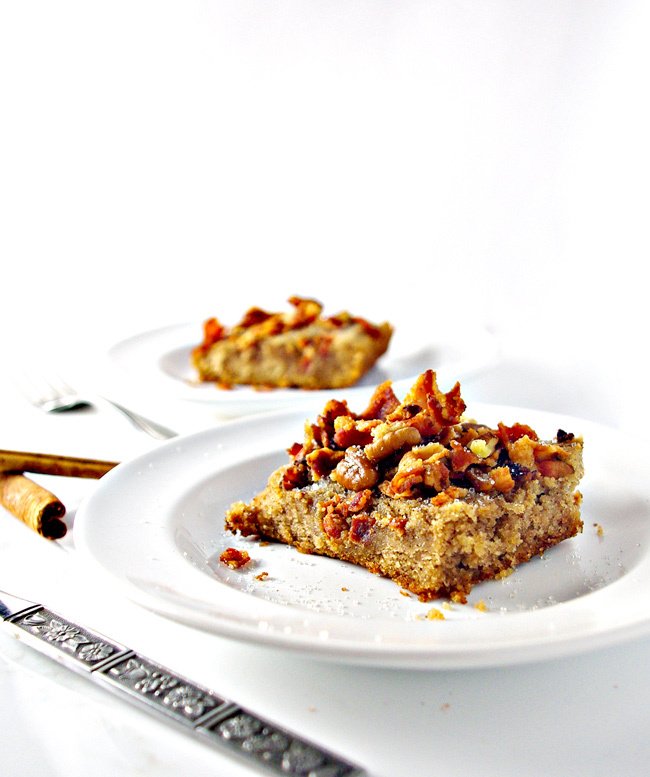 Furthermore, Grain-Free Maple Bacon Coffee Cake is also a paleo-friendly, gluten-free, dairy-free, and soy-free cake recipe. Who knew you could get all of that in one recipe? We do, Spiriteds, we do. For added flavor and pizzazz, I add chopped nuts (macadamia nuts, walnuts, pecans, and cashews come to mind) and a granulated sweetener of choice (think organic raw sugar or coconut sugar). Then after baking, I set it aside to cool slightly before serving. Finally, while it’s still warm, we dig in, savoring each sweet, savory bite as we go! Fry bacon in a shallow frying pan to a crispy consistency. Place fried bacon on a plate between two paper towels or napkins to absorb any excess grease. While the bacon is frying, in a large bowl combine the almond flour, coconut flour, baking soda, cinnamon, allspice, and nutmeg. Stir in the melted coconut oil, maple syrup, agave nectar or honey, apple cider vinegar, and vanilla. In a separate bowl, whisk together the almond milk and egg and pour into the batter, stirring until evenly mixed. Add in the bacon grease and stir evenly. Add approximately half crumbled bacon pieces. If the batter is sticky, you may need to knead the crumbled bacon pieces by hand to prevent clumping. Pour mixture into an 8×8 glass baking dish and bake covered with foil for 15 minutes, rotating one time during baking. Remove foil and bake another 5 minutes. Bake another 1-2 minutes uncovered or until inserted toothpick comes out clean. 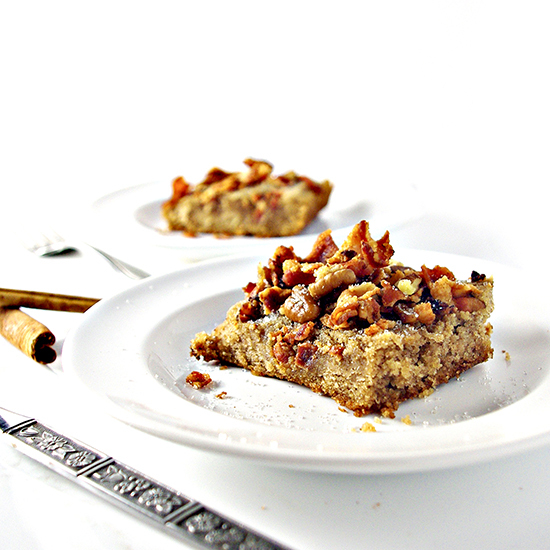 Let cool slightly and top with nuts, seeds, or granulated sweetener. Serve immediately. For best results consume within 24 hours.